A decade ago, Eugene Pettis, Jr., walked the south side streets of Milwaukee. Most everywhere he went in his zip code, the utmost respect followed. Didn’t matter that he worked as a janitor. Eugene Pettis’ extraordinary fighting spirit and well-documented history of fearlessness earned him tons of street cred in a drug- and crime-infested neighborhood. Almost everyone knew Eugene Pettis. Society would, without question, be infinitely better if more survivors of street life recognized their power to pave a less perilous path for their children. To his credit, such was the conscience of Eugene Pettis. The street fighting legend with a fast past craved better for his four kids and was disciplined enough to work two jobs so they could attend private schools and pursue opportunities that seemed far out of reach for a hustler “trying to make a dollar out of 15 cents” as they say. Yet “The Godfather” would not live long enough to see that he had, in fact, “done something right.” Eugene Pettis, 46, was killed a decade ago during an armed robbery. He did not live to see his children defy the odds and stay on the right side of the law. He did not live to see his oldest son become not only a model citizen, but a two-time world champion fighter and an emerging businessman with 32 affiliate gyms nationwide. In many ways 26-year-old Anthony embodies the timeless maxim “Like father, like son.” There is a quote, in huge letters, prominently positioned on Pettis’ Twitter page. Of all the words his father ever said to him, those are the words Anthony Pettis remembers most vividly. The words chained to his heart and soul. Words he lives by. Indeed, to watch Anthony Pettis fight inside a cage is to perhaps catch a glimpse of the street fighting ferocity of his father. A reminder that the fruit rarely falls far from the tree. Rather poetically, ‘The Godfather’s Son’ also feels plenty of love any time he’s out and about in Milwaukee – or almost any other city in the nation for that matter. Before it was his Pop’s hand; now Anthony’s is the hand everyone wants to shake these days. That’s what happens when they call you “Champ,” when you own one of the most famous kicks in UFC history that has been viewed millions of times, and when you have Ricky Martin good looks (but happen to be straight, for the record. Not that there’s anything wrong with THAT, of course ). Like Urijah Faber in Sacramento and Georges St. Pierre in Montreal, Pettis has a special love affair with the only city he has ever lived in. That fact alone is remarkable. While many American fighters feel occupationally compelled to relocate to traditional MMA training hotspots in California, New Mexico, Las Vegas, Florida or New York, Pettis has stiff-armed the trend and faithfully remained in Milwaukee with Duke Roufus, who is finally being recognized as one of the brightest minds in the fight game. That means Pettis is almost entirely homegrown. He is the human version of “Milwaukee’s Best,” only it’s not beer he’s putting on the map, it’s Wisconsin MMA. Part of the reason Pettis stayed in Milwaukee is to be close to his mother and younger brothers. He also enjoys an especially close bond with Roufus, a master motivator who began coaching Pettis at 19 and doubles as a father figure of sorts. The sports world, the whole world in fact, is overflowing with talented people. Why do so few achieve greatness? 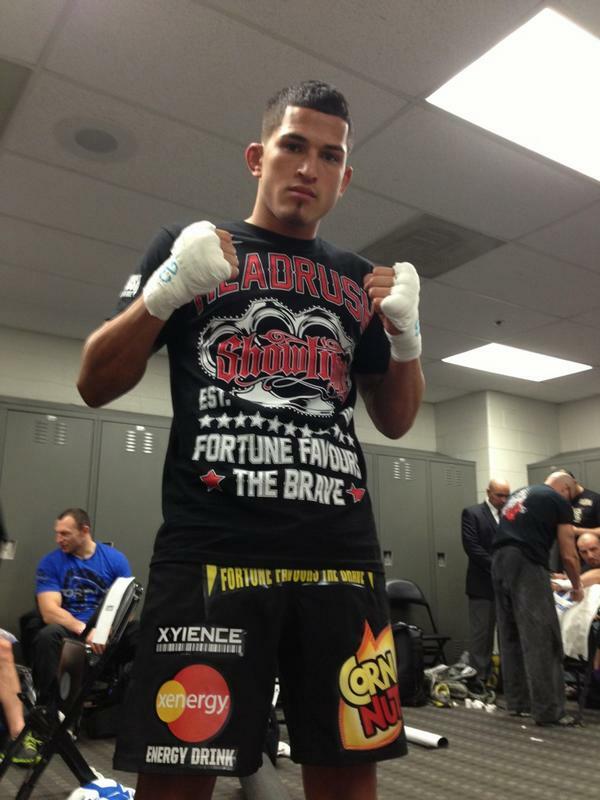 In Anthony Pettis’ case, his confidence on fight night simply jumps off the radar. It is other-worldly. On his official Twitter page, long before he stepped into the cage and dethroned Benson Henderson, Pettis publicly and boldly proclaimed himself “Best Lightweight In the World.” Even when someone else was wearing the belt, even though he had two losses on his record. It’s one thing to tell yourself such things. It’s another to blast it to the entire world. I’ve been chronicling UFC for 12-plus years. And I’ve enjoyed a front row seat to study the top 1 percent, the Kings of Confidence, who stood out among the rest. Names like Anderson Silva, Cain Velasquez, Wanderlei Silva (years ago in his prime) and Dominick Cruz rush to mind. Pettis belongs in that elite category for Faith in Self and an unflappable and unflinching “Go Big or Go Home” mentality. If there is ever a Who is the Most Confident Fighter in the World? category, Pettis should be a slam dunk in the conversation. So not surprisingly, it is fascinating to hear the UFC lightweight champ point to the source of that confidence. “I put that confidence into myself,” he said. “I had to go to a lot of different people for a father figure and a lot of stuff I learned on my own. I’ve made a lot of mistakes and I’ve done a lot of stupid stuff. I was alone out here: I didn’t have somebody giving me advice on jobs, career, women … dealing with the normal struggles of a teenager. They don’t call him “Showtime” for nothing, do they? Interesting thing is, despite a championship mindset and elite athleticism to match, Pettis isn’t always the Best Fighter in the Gym. Like Dominick Cruz and some of the great ones, Pettis has a switch he can flip. The brighter the lights, the better he is. Which UFC champs have been the most prolific and daring when it comes to finishing opponents? “Rowdy” Ronda Rousey tops the list with a perfect 100% finish rate in 7 fights (all in the first round and via her trademark armbar, of course). Coming in second is the relentless rag-dolling machine that is Cain Velasquez (83%), followed by – surprise – Mr. Pettis at 82%. Jon Jones is next with 79% of his wins by submission or stoppage. Legend-in-the-making Jose Aldo is tied with Middlewight King Chris Weidman with 70% of their wins coming inside the distance, with Aldo teammate and Bantamweight interim champ Renan Barao just behind them at 67%. Georges St. Pierre, oft-criticized for his extreme caution inside the octagon, comes in at 54%, and Dominick Cruz at 37%. It is also interesting to juxtapose Pettis’ wins-by-finish rate with two of his predecessors. Frankie Edgar, a boxer-wrestler, won 44 percent of the time by sub or stoppage. Benson Henderson was slightly better at 53 percent. Five or six years ago Roufus absolutely raved about Pettis to me. Every superlative you could think of was flying off Roufus’ tongue. “He’s going to be the Latin GSP,” Roufus said, comparing Pettis to Georges St. Pierre, of course. Some might have dismissed the GSP comparison as hyperbole, but the prophesy doesn’t seem crazy now, does it? No. (Funny, when your broke and full of big dreams and big ideas – people think you’re crazy. When your rich and full of big dreams and ideas – people treat you like you’re some kind of genius). Pettis certainly possesses all the attributes of an MMA star who could cross-over and eventually have a huge mainstream following. He has the look and the likeability (and could pull in the female demographic like few can). He has the cool and the swag (boyish charm, man-fighting skills). He’s got the background story that will tug at people’s heart strings and make them root for him. And he’s a mix of Puerto Rican and Mexican blood, so the Latino and Hispanic fan base (one of the fight game’s most important demos) is going to love him. So Pettis has a chance to be the sport’s most famous lightweight since B.J. Penn. There is just one thing standing between Pettis and superstardom in the sport: Gotta keep winning, baby. Though Pettis is immensely talented physically and intangibly, racking up wins and keeping the belt figures to be a tall order. Aside from the fact that some consider Pettis to be injury-prone (a perception he rejects, by the way, though he has been sidelined with a knee ligament since the Bendo fight) the UFC lightweight division is a virtual Murderer’s Row for anyone inside the Top 10 (arguably the deepest division in the sport). Stats reflect the challenge ahead: In the history of the UFC’s lightweight division, no champ has been able to defend the title four times successfully. The terrain of the division is that hellaciously stormy and bumpy. Remarkably, only two lightweight champs have been able to defend the three times: The legendary B.J. Penn and Benson Henderson. So just four straight wins would put Pettis in the history books and catapult Showtime into the big time (as in, chance to cash in handsomely with big league sponsors and the kind of mass recognition among fans that helps him move the pay-per-view needle in the stratosphere of talents like Jon Jones, GSP and Anderson Silva). For his part, Pettis is not a quiet, tongue-tied champ when in the spotlight (ala Cain Velasquez). Pettis thrives accepts being the center of attention. Immediately after becoming the first man to submit Benson Henderson, a BJJ black belt, Pettis and business affiliates from his Victory Martial Arts franchise hit the Bahamas for their annual rest-fest. 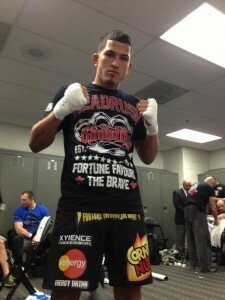 Pettis got a taste of what’s to come after winning his second world title. Bad Blood with Jose Aldo? Pettis’ first title defense was slated to be against T.J. Grant; an injury to Grant foiled those plans. Pettis will now fight Dec. 14 against Josh Thomson (20-5 record), a surprise but dangerous option and the only man to stop Nate Diaz. Though there are options aplenty at lightweight, Pettis also feels he has unfinished business with UFC featherweight kingpin Jose Aldo, whom he was scheduled to fight this summer before being scratched from the card with a knee injury. Pettis wants the superfight sooner than later, but stressed it’s not personal. One of Anthony Pettis’ favorite books? Rich Dad, Poor Dad, the best-selling book by Robert Kiyosaki. Business books. That’s what Pettis seeks out. He steers clear of self-help and motivational titles, feeling no need for them. It would be hard to bet against the Godfather’s Son’s ultimate vision because his track record for goal-fulfillment and making history and forcing fans to pinch themselves in disbelief is other-worldly. He credits his mom, Annette Garcia, more than anyone for his success. He imagines his father “would be super-proud” and alluded to a father-son relationship in the sport that he admires and might have enjoyed similarly but for that fateful, life-changing day 10 years ago. It is well-known by now that after winning the UFC title in his hometown, Pettis attended a post-fight presser and then – after 1 a.m. – went to his father’s grave site and placed his belt atop the tombstone.